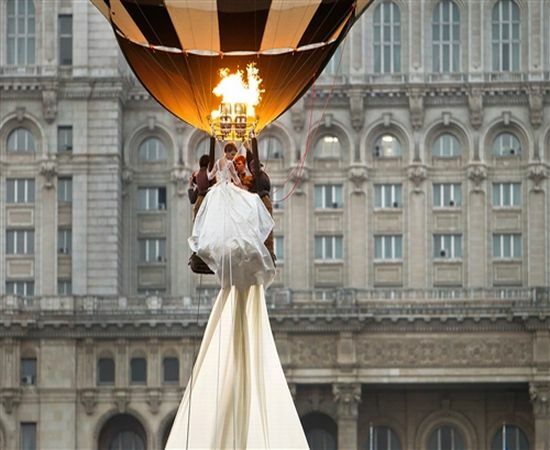 This Silk Wedding Gown breaks the records as the longest bridal trail rolling on to 3,000 meters or 1.85 mile. This silk wedding dress unveiled on on board a hot air balloon floating across the skies of Romanian capital, Bucharest. On the left is the pictures of Model Emma Dumitrescu, 17, holds a certificate proclaiming the train flowing behind her to be the longest in the world. 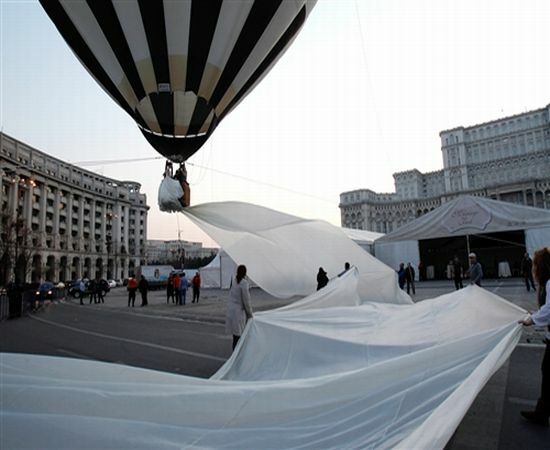 A Bucharest fashion house broke previous Guinness records by launching its 1.85-long trailed wedding gown. Guinness officials testified that the nearly two meter long bridal trail surpasses the previous record of 1.54 -mile-long bridal train (2,488 meters) that was a Dutch creation. The exquisite gown was crafted by 10 seamstresses over 100 days and displayed nuances at the Bucharest Wedding Fair. Studded with around 13000 rare pearls, the trailing gown becomes more of an object of desire. The gown could tip the scale at 13 pounds making it heavier with 15,420 feet of Taffeta. 18 feet of Chantilly lace and other lining materials at 147.64 feet formed part of the resource. Sewing needles accounting to 1,857 needles and 150 thread reels were used to create a beautiful ensemble. Via : Today and Bornrich.